Up the ante with a minced beef and mushroom duxelle sausage roll with homemade mustard and herb, rough puff pastry. 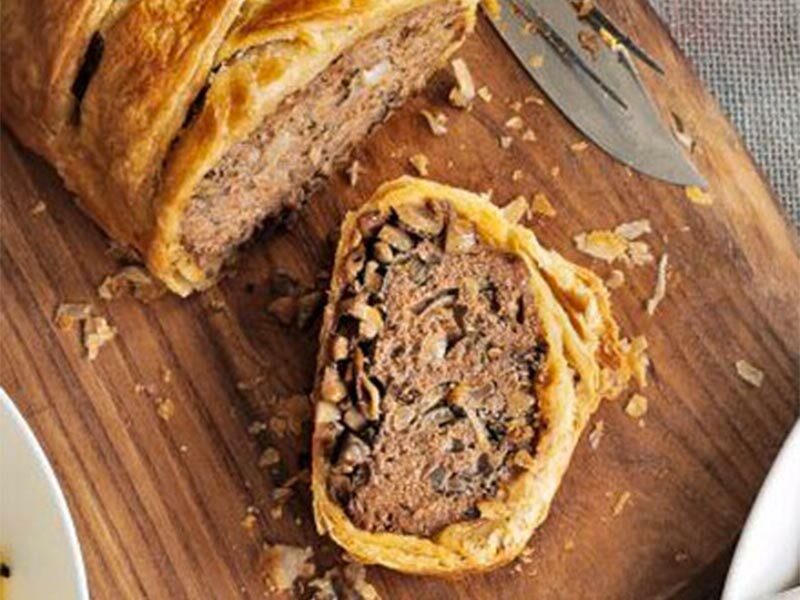 The Minced Beef Wellington comes from John Torode - with a few variations. White wine isn't the norm in a duxelle but with all that rich meat and pastry it adds a welcome edge of acidity. You can buy good quality, all butter, puff pastry or aim even higher with Dan Lepard's fancy rough puff - https://www.theguardian.com/lifeandstyle/2013/mar/09/dan-lepard-chicken-bacon-pie-red-wine-mustard-crust. 1Gently sauté the onion and garlic until soft and quite dry. Using a food processor or a bowl and wooden spoon, mix the beef with the ketchup, 1 beaten egg, seasoning and 50ml water (just pulse it if using a food processor to prevent it going rubbery). Mix in the onion and butternut squash, sage and thyme. Season with salt and pepper. 2Heat oven to 190°C. Form the meat into two sausages (about 20x7cm) and place on a baking tray. Cook for 10-15 mins, until they’ve firmed up a bit, then remove and leave to cool. 3Heat the butter in a frying pan, add the mushrooms, chopped parsley stalks and shallots and cook for 5 mins, pouring off the excess liquid. Add the wine and cook until absorbed or evaporated and stir in the chopped parsley leaves. Cook for another minute, remove from the heat and cool for 10 mins. Roll out the pastry into two sheets big enough to wrap the meat sausage. Spread the mushroom mix into a strip along the middle of the pastry. Place the sausage on top, brush the edge with egg, fold over and crimp along the top. Brush with the remaining egg, then place on a tray and cook for 30-40 mins, or until the pastry is cooked.